I hate pumpkin pie. I know this is the season for it and making a statement like that is probably heresy, but I keep giving it a chance and each time....bleh. I guess it's just not my thing, but I always felt like I was missing out on a tradition. My coworker told me about a variation about a year or two ago in a long winded tale of how he can't find one anywhere and how he'd PAY to have it right NOW. Huh. An opportunity to learn a new recipe, make someone happy, and possibly recoup the cost of the ingredients...how could I pass it up? 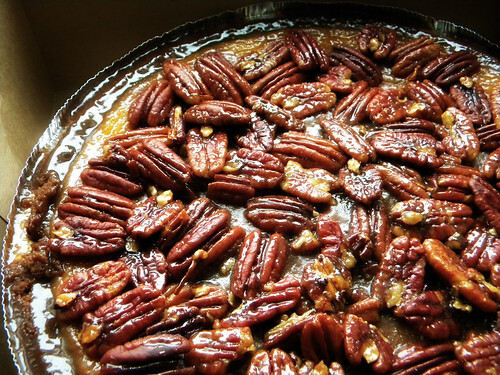 The pie he wove tales of was a sweet potato pie, with a graham cracker crust and a pecan topping. Doesn't that just sound yummy? I thought it did, so I gave it a try and the pie came out great. I also learned that while it looks just like pumpkin pie, it doesn't taste like it, not really, and I love this variation. Also, if I remember the story correctly, I think my coworker took his pie to a poker game and made money by selling it to his hungry friends by the slice towards the end of the game when snacks ran out. This was over a year ago and recently he's been hinting that life would be a heck of a lot better if that pie found it's way back into his life and when I found myself in front of a pile of sweet potatoes at the grocery store, I thought of him and caved. You can make the crust yourself with some crushed graham crackers and melted butter, but usually I cheat and just buy one. It's the one time I don't think homemade makes that much of a difference. Preheat the oven to 400°F and set the oven rack to the middle of the oven. You could bake the sweet potatoes in the oven if you like, but I find that it takes too long and your microwave can do the job in a fraction of the time, so...stab the sweet potatoes with a fork all over (very therapeutic), place in a microwave safe bowl, cover loosely with a paper towel to avoid cleanup later, and nuke for about 10 minutes, turning them over around the 7 minute mark so they cook evenly. Poke them a few times with a fork to make sure they're done and pop back in for two more minutes if you hit a firm spot. Cool until you can handle them, peel and mash in a large bowl until smooth. I'm impatient and I usually pretend I've got asbestos hands so I don't wait to peel them and then I end up doing a little dance where I peel a piece off and then hop about blowing on my singed fingers for a second before doing it all over again. Don't be like me. Wait. Melt the butter in a small saucepan and stir in the sugar. Add the melted butter mixture to the sweet potatoes with the milk and the eggs and beat with a whisk until smooth. Whisk in the remaining ingredients (the filling will be pretty liquid) and pour the filling into the pie shell. Stir first 3 ingredients in heavy medium saucepan over low heat until sugar dissolves. Increase heat and boil 1 minute. Mix in nuts, coating completely. Carefully take the pie out of the oven (aren't you glad you used the sheet pan now?) and spoon the hot nut mixture all over pie, distributing the nuts evenly over the top. Put the pie back in the oven and continue baking until topping bubbles, about 5 minutes. Transfer to rack and cool completely. Thank you for posting this as I have been wanting to make a sweet potato pie for Thanksgiving this year and have never attempted one before. Yours looks wonderful! I saw this on Tastespotting and I HAVE to make. Like right now. I'm leaving for the store to get some of the stuff NOW...that's a testament to how great your photo is! Thanks! How about a little game of Poker?